Launchpad does not have private projects…yet. Nothing breaks my heart quite like a request to make a project private–make it invisible to everyone except to the people the project trusts. I am utterly crushed when someone who works for Canonical or on Launchpad asks for one. I have been planning this feature for more than two years, and the Purple squad has been working on it for 13 months. I blog about this, I send emails about this, I present reports on this, but the people who most need private projects don’t know what the Purple squad is doing. I think the problem here is that Launchpad squads no longer use Launchpad to plan and execute work. There is no place for any interested party to see what the goals of Disclosure is and gauge how we are progressing. I present my first draft of a report that states the simple goals of that the Disclosure feature wants to achieve . The report provides some summaries of the work that allows anyone to see what the Purple squad is doing, recently done, and will do next. There is also some analysis that provides insight into the amount of work remaining. This report complements the Purple squad’s kanban board. While kanban is excellent for tracking branches of code and technical tasks, the level of detail is unsuitable for non-Launchpad developers. The kanban board is also only accessible to a small number of people. I want a report that anyone interested in private projects or managing the disclosure of private information can see and understand. Mostly, I want everyone to see that the Purple squad is delivering valuable features and know when we will be done. I based the report on the intended reporting UI for Launchpad series and milestones. I really miss using series and milestones to plan releases. For every milestone, I wrote our goals in the summary, and targeted bugs to the milestone. Though we abandoned the analytics because of performance concerns, I could reliably judge the contributors’ velocity, and see when I needed to retarget work to another milestone because the remaining effort exceeded the milestone’s work capacity. Though I didn’t provide a burn down chart of the work, I could sort the milestone to see the colour change. I could confidently see and predict 3 months of work. This report replaces the canvas-based chart I planned for series and milestones with a YUI 3 chart. The listing of bugs are split into categories so that I can focus on scheduling or provide Diogo with a list of bugs that need exploratory testing. Though this report thinks it is talking to Launchpad, it is actually using JSON for the 500+ bugs that I pulled using a trivial Launchpad API script. Since the data is cheap to retrieve, I can load the chart multiple times, each looking a different set of bug tags so that I can see specific themes of work. The report shows that there is more than 60 days of work to complete the features needed by private projects. The Orange squad will work on private projects while the Purple squad finishes the prerequisites. All users can now see the information type section that replaces the privacy and security section shown on bug and branch pages. This change allows users to clearly state the kind of information a bug or branch contains. Launchpad will soon permit project maintainers to share information types instead of managing individual bug and branch subscriptions. Project maintainers can see a link on their project’s front page to the “Sharing” page. Sharing lists all the users and teams their project shares some private bugs and branches with. This list might be surprising. Launchpad Beta testers will soon be able share and unshare kinds of information to simplify management of whom the project discloses private information to. 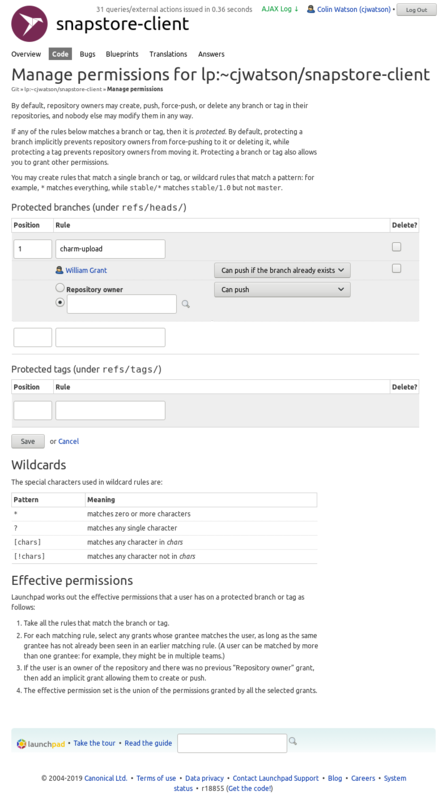 See Reimaging the nature of privacy in Launchpad for more details. The Purple Squad recently discussed how the forthcoming sharing feature changes project setup. Sharing will allow project maintainers to share kinds of information with users and team. This feature separates access to private information from bug and branch subscriptions. Maintainers do not need to manage hundreds of subscriptions, users do not needs to block unwanted email. Before sharing, direct subscriptions were the only way Launchpad knew which users the bug or branch was disclosed to. Launchpad would subscribe the maintainer, or the team in a designated role to ensure someone could work with the information in the bug or branch. The subscribed users would then be responsible for subscribing other users and team so that everyone who needs to know about the information could work with it. Most users subscribed to private bugs and branches get unsolicited email. Each user’s project, series, and milestone subscriptions are ignored. After sharing, subscriptions to projects, series, and milestones will just work. If a private bug matches your project subscriptions, and that kind of information is shared with you, you will get the email. You will be able to subscribe to kinds of information, such as embargoed security. The security contact role is obsoleted by sharing. It can be removed. The security contact exists to tell Launchpad which team to subscribe to embargoed security bugs to ensure the information is disclosed to someone. The role does not convey any other privileges. Only one team could be in the role; it was not possible to tell Launchpad that embargoed security bugs should be disclosed to several teams. Sharing allows the maintainer to specify which teams embargoed security information is disclosed to. The bug listing page implies that no one has access to security information when the role is not set. This was never the case. Launchpad subscribed the maintainer to the bug if no one was in the security contact role. Maybe Launchpad should show a notice to maintainers when it detects that no one is subscribed to get security mail? This presumes email is how users want to be notified. It think this is nice to have, but not a requirement. I would prefer Launchpad to present a log of recent activity on its pages and send me emails that summarise important activity when I have not visited the pages recently. The bug supervisor looses its private bug responsibilities after sharing. It is still useful to delegated additional bug editing privileges to a team who does not drive development decisions. The bug supervisor role will be used less often. Most teams currently in the bug supervisor role are also in the driver or maintainer role. Launchpad required maintainers to set the bug supervisor role to ensure that those that plan released can also see the private bugs. Small projects will not need the role. It will only be needed by projects that want to expand the number of contributor who can triage bugs without expanding the number of people who do release management. The maintainer role is unchanged by sharing. Well, it responsibilities are unchanged, so we must ensure that the project shares private information with the maintainer by default. When a project is registered, Launchpad must share each kind of private information with the maintainer. This is rule is not as simple as you might think. Many projects are registered by a user, who sets a team as the maintainer during setup. From Launchpad’s perspective, the project has transferred the role. Launchpad does not know what to do . Some maintainers do not want to work with private information, they delegate to other teams. Launchpad cannot presume that changing the maintainer means changing who private information is disclosed to. Maintainers can always choose to share the information with themselves. Launchpad’s project setup workflow is incomplete. There are two screens that gather the basic information, but you can set additional information on the project front page. There are five pages to configure how the project uses Launchpad that maintainers should review during setup, but we did not have the time integrate them. We do not want users to do more work. Instead we want Launchpad to present just the essential information and have sensible defaults. Reimaging/completing project setup is out of scope for the sharing feature, but it might be in scope for the Purple Squads next feature, private projects. During setup, Launchpad needs to know who the maintainer will be and share private information with them. We can consider this work as an enhancement to maintain expected behaviour. We will do this work as a part of the sharing feature. When we work on private projects, we can explore what else project setup and reconfigure needs to do to ensure that information is disclosed to the proper teams. Private projects will also entail making projects public, which means reconfiguring the kinds of information a project has. If you have ever changed the bug supervisor or security contact, you might know of the pain I am alluding to. Bang head against desk, scream at computer, weep, set aside a few weeks of your valuable time to update all bug subscriptions yourself so that the new team can do it’s job. This whole scenario is implicitly fixed by sharing since subscriptions are not used to manage access.